VYCON's VDC-XE backup systems bring unprecedented power capacity for instantaneous and reliable backup power for today's mission-critical applications. Data centres, hospitals, broadcast studios, casino, gaming centres, and manufacturing plants are enjoying the reliability benefits of VYCON's flywheel energy storage systems. Utilizing clean energy storage from VYCON's patented flywheel technology, the VDC-XE is the perfect solution for users needing a more reliable and greener approach to backup power in place of hazardous lead acid based batteries. Compatible with most major brands of three-phase UPSs, the system's interface with the DC bus of the UPS just like a bank of batteries, receiving charging current from the UPS and providing DC current to the UPS inverter during discharge. A green energy storage solution… with an impressive ROI! While many green solutions are good for the environment, few actually have a return on investment that can help a company’s bottom line. 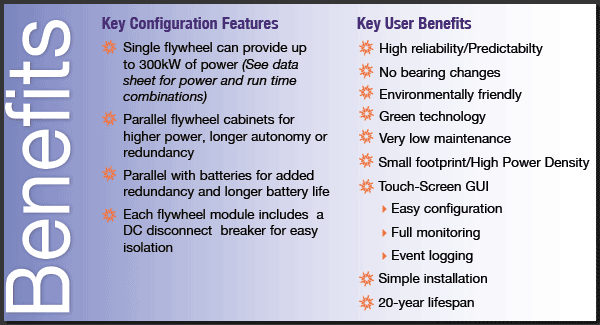 The VDC line of flywheel energy storage systems not only offers improved reliability, takes up less space, and has virtually no maintenance, but they also have an attractive 2.5 year ROI and can save a facility hundreds of thousands of dollars over a 20 year life. The figures above are based on a typical installation of a 250kVA UPS using 10 year design life VRLA batteries housed in a cabinet. The yearly maintenance for the batteries is based on a recommended quarterly check on the battery health to have some predictability on their availability. These figures don’t include floor space or cooling cost savings that can be achieved by using the flywheel energy storage vs. batteries. Let us customize an ROI calculation based on your particular application and costs. Our applications engineers can help guide you through the process of determining your ROI with just a few questions. 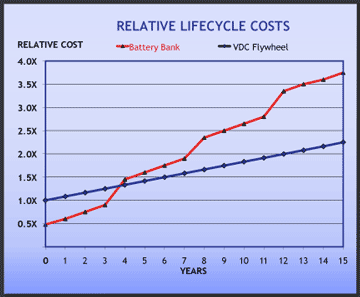 In addition, VYCON offers attractive lease-to-purchase options that allow you to have a lower capital cost upfront, make yearly “usage” payments (instead of paying for battery maintenance), and own the flywheel after 5 years. The savings after the purchase are all to your benefit. Contact us for more information on either ROI or various payment options.